The Nefyn road out of Llanaelhaearn climbs steeply up towards Bwlch yr Eifl. On the right rises Tre’r Ceiri, which so often as we pass seems to be cloaked in mist, its top is home to the amazing remains of an Iron Age hill fort later a Romano British settlement; stone hut circles and ramparts appear scattered randomly everywhere across the hill top. On a clear day the summit provides views of the sea on both sides of the peninsula – Nefyn to the north and Abersoch to the south. Nearby, on the opposite side of the road slightly dwarfed by its neighbour is the rounded, cairn topped Mynydd Carnguwch. 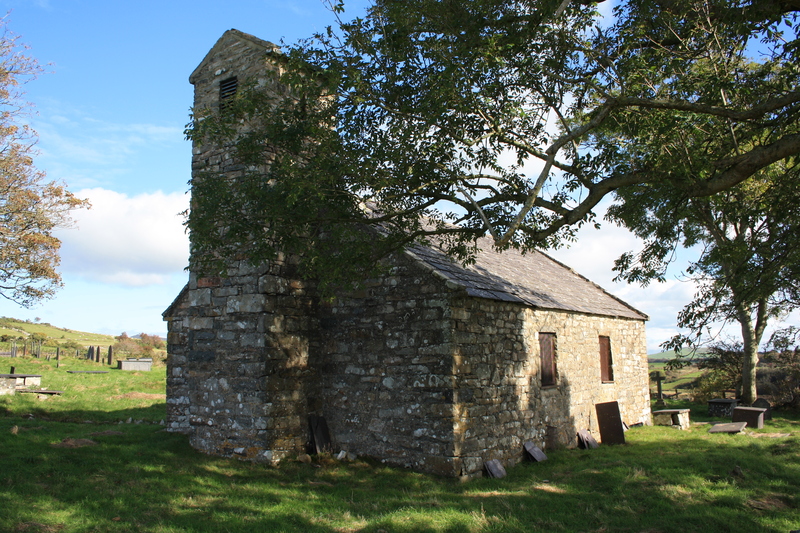 St Beuno’s church at Carnguwch and its associated holy well shelter close to the foot of the mountain, around the far side from Tre’r Ceiri. It is best reached by a lane to the left, signposted to the church just as you reach Llithfaen. From this lane a downwards sloping track leads towards the church which sits in the middle of a field. Established since at least the 13th century, it was substantially rebuilt in the 19th century but soon after abandoned as the population centre moved away from the surrounding farming communities towards expanding Llithfaen and new churches were built there to save worshippers the muddy slog across the fields. Now deconsecrated Beuno’s church is maintained by a Friends of Carnguwch Church group. The church was locked, with no indication of where to find a key, so we couldn’t visit it, but signs of recent work and new windows on one side suggest that it is still being looked after. The original church it is claimed was founded by Beuno, from his based up the road at Clynnog his influence spread along the Llyn. Some texts give a nod to a little known St Cuwch though evidence for her influence, or even existence is minimal. The only story that any text seems to quote regarding the church and its well derive from Myrddin Fardd’s note that a vessel of well water was kept by the door of the church and a brush, known as ysgub y cwhwfan was used to sprinkle water over each member of the congregation as he or she entered the church. Fardd implies that this custom remained within living memory when he collected information in the early twentieth century. 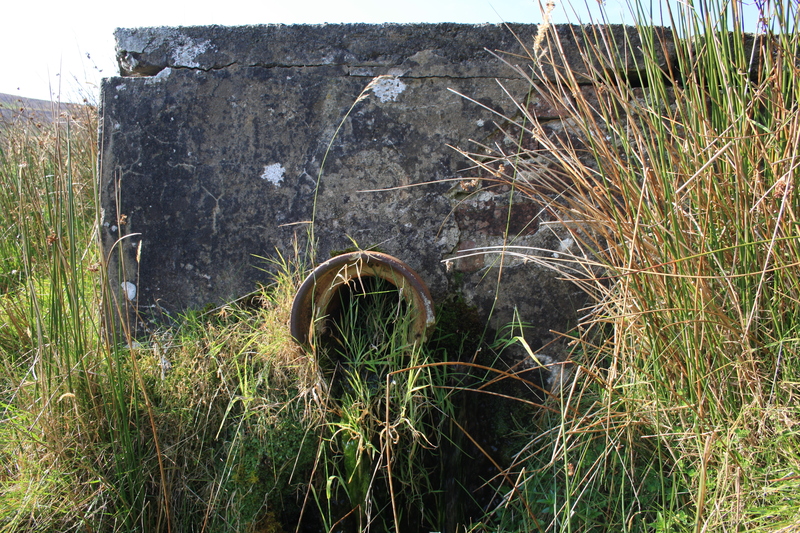 The holy well, Ffynnon Sanctaidd is known to lie close by the church. Fardd says that at one time it was surrounded by a stone construction with steps down to the water on either side. Of this little if anything remains. There are a number of small springs close by marked on the map, and at least two different reports as to which is Ffynnon Sanctaidd. We examined several, and the most likely looking candidate appeared to be that documented in around 2005 during a widespread survey of the wells on the Llyn Peninsula by Gwynedd County Council although the grid reference on their record is a kilometre out. 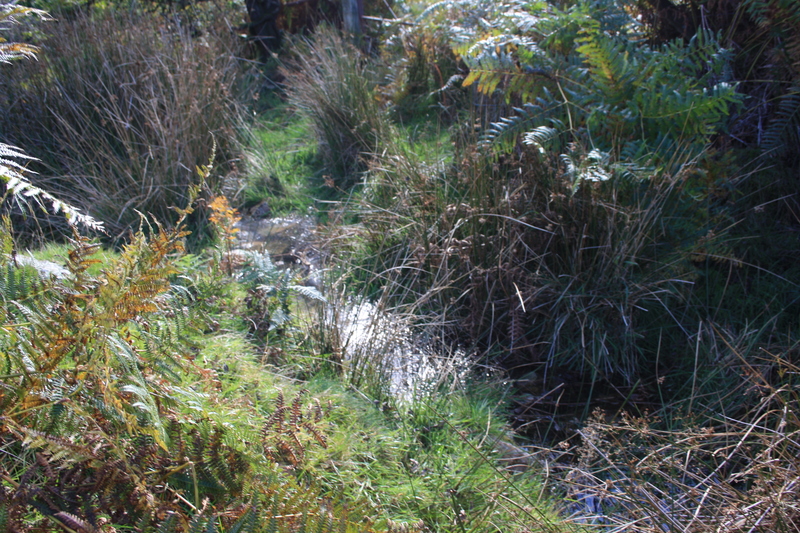 This spring lies some 300 yards to the north east of the church at the foot of a steep bank marking the division between the foot of Mynydd Carnguwch and the plain of the River Erch. A strong spring rises at this point forms a stream flowing southwards towards the Erch. 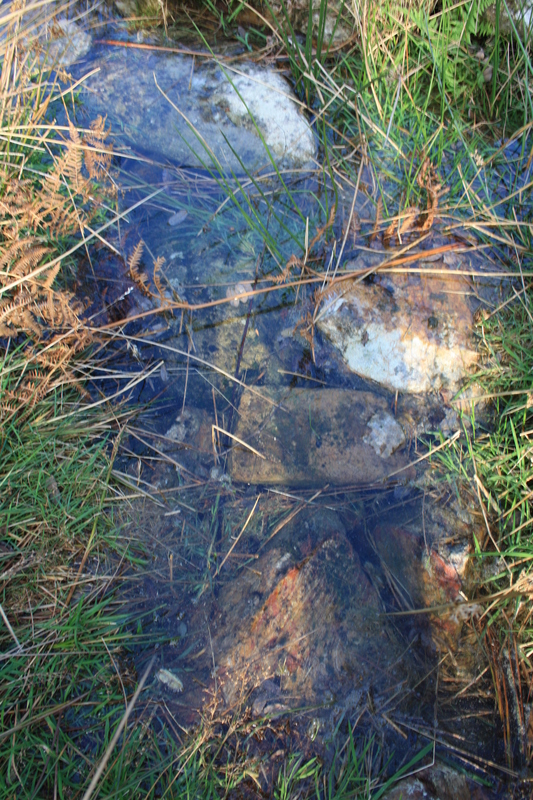 Although no evidence of structure remains there is stone littered around and in the stream bed. The pool is in a small hollow in the landscape suggesting that steps may well have once been needed for access. Continue on along the track around Mynydd Carnguwch and you return to the main road. In the field on the right hand side as you approach the junction the remains of a building can be seen. This was the cottage of Cae Garw, and beside it another well once in much repute and visited for cures for rheumatism and warts. Again, in line with a very common tradition a pin was cast into the well, one for each wart, to obtain a cure. Early maps show a spring immediately to the south of the house, and the ground here is till very boggy with reeds growing from it. 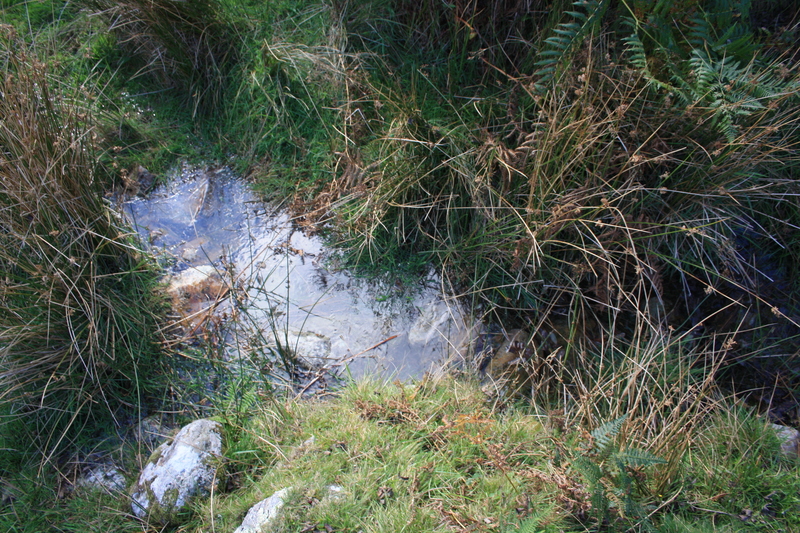 However, an earlier description of Cae Garw gave it as a strong stream issuing from the ground. It seems as though the spring has now been tapped to form a local water supply. Towards the eastern side of the field there is a large concrete tank, from which an overflow streams across the field. We assume that this now represents the flow of Ffynnon Cae Garw.